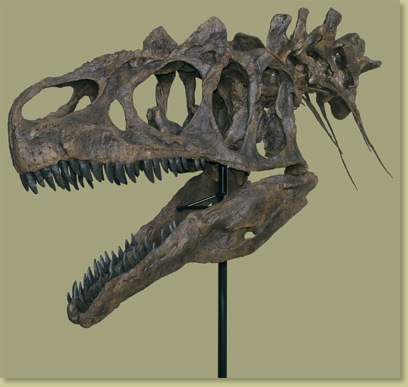 Allosaurus is one of the most famous of all dinosaurs. An Allosaurus bone bed has been discovered near Price, Utah, which supports the theory that Allosaurus lived and hunted in packs. Dr. Robert Bakker’s site in Wyoming includes many gnawed bones and tiny teeth, which may indicate Allosaurus cared for their young. They have a narrow skull, two small horns, and eyes on the side of the skull, which would mean they did not have the same degree of binocular vision as Tyrannosaurus rex. This excellent Allosaurus skull is cast from a nearly complete skull and skeleton, nicknamed BIG AL TWO, from the Howe Stephens Quarry near Greybull, WY. The original skull and skeleton are on display at the Saurier Museum in Aathal, Switzerland. The skull was mostly articulated and has extremely large lacrimal horns, much larger proportionally than most other specimens of Allosaurus. This raises the question of whether or not it represents a new species of Allosaurus. This skeleton is a small, yet fully grown adult, which reached nearly eight feet high at the hips, and 26 feet in length. The BIG AL TWO skull with neck replica features the skull, plus five cervical (neck) vertebrae and four sets of cervical ribs. It comes mounted on a custom made steel base. Consider displaying this amazing skull with our custom media display board containing photographs and information on this incredible find. Notes May take approximately 3 months for delivery. Check with us to see if an earlier delivery is possible.